Women will continue to be the driving force in the decision-making process for most U.S. households. Whether they represent half of a household in which they are part of the decision-making process, or control all of the financial decisions, their approach to investments and their relationships with financial advisors are very different than for men. 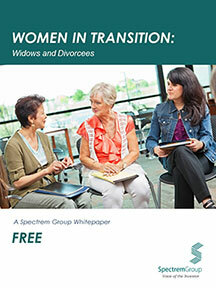 Spectrem's Women in Transition whitepaper focuses on affluent women who have experienced a divorce or the loss of a husband and the impact the event has had on their financial and investment behaviors.